Thinking of aquariums on the most basic level, one can equate the building to any structure that holds water. While this idea leaves the form of aquariums extremely open, there are already examples of these containers found in the natural world. 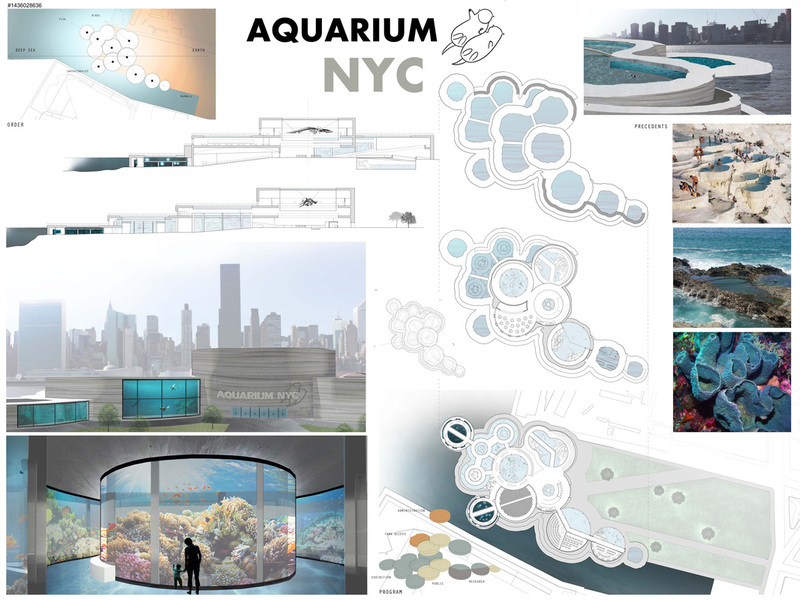 The concept behind Aquarium NYC comes from the most spectacular formations where water pools naturally and supports life without human aid. 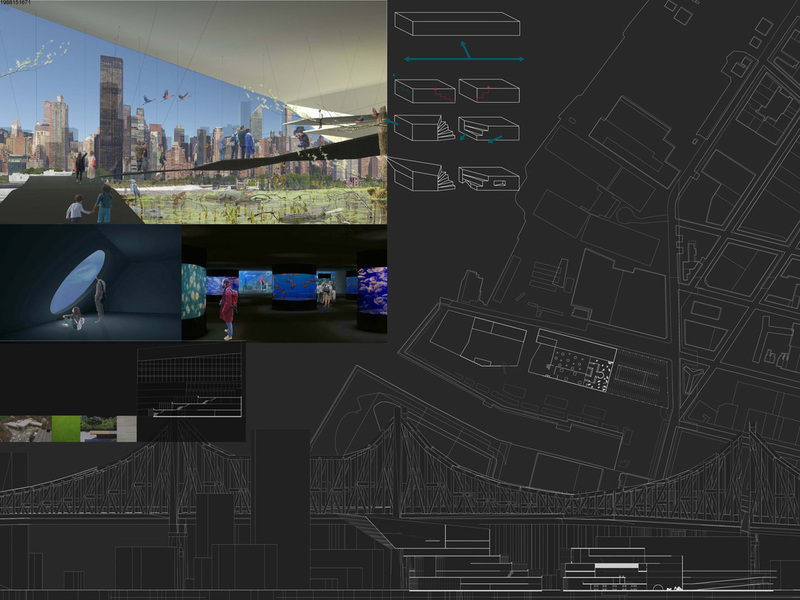 As Aquarium NYC takes its shape from these formations, it utilizes the space otherwise uninhabitable in nature to develop multiple viewing experiences and to create a new relationship between the sea creatures and their viewers. 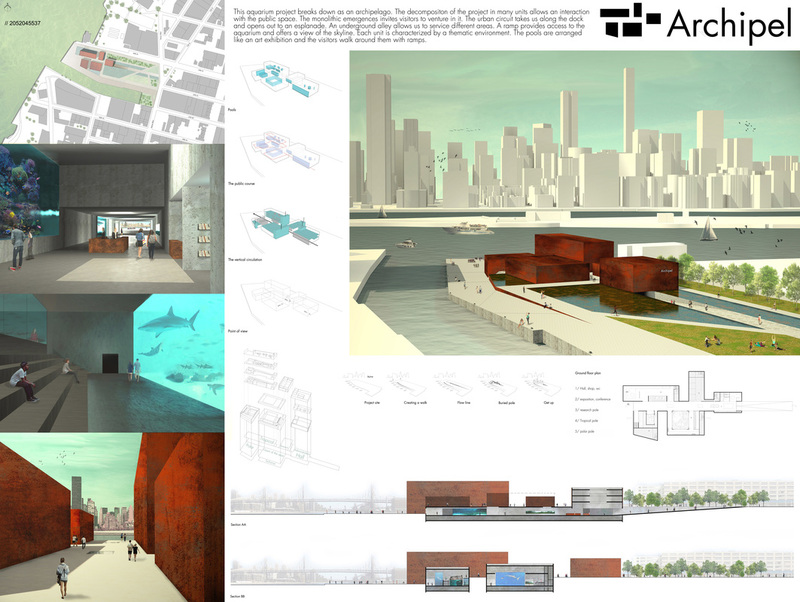 The Endangered Species Aquarium in New York is a "public space for everyone” facility to house, research, exhibit and teach the public about endangered marine flora and fauna with an inclusive and welcoming architecture and landscape in one of the most culturally significant cities in the world. 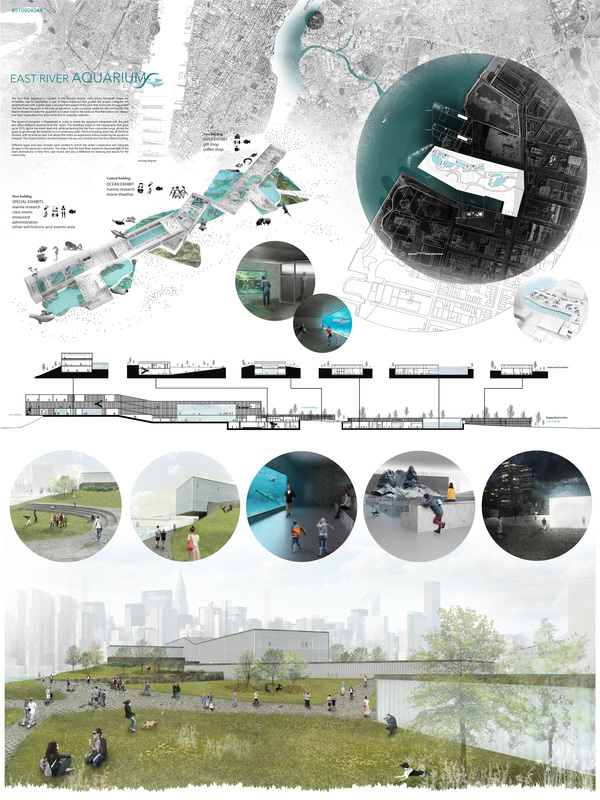 It is designed as a set of buildings within a public garden to justify repeated and casual visits about a topic that is not casual in an increasingly volatile hydrosphere. 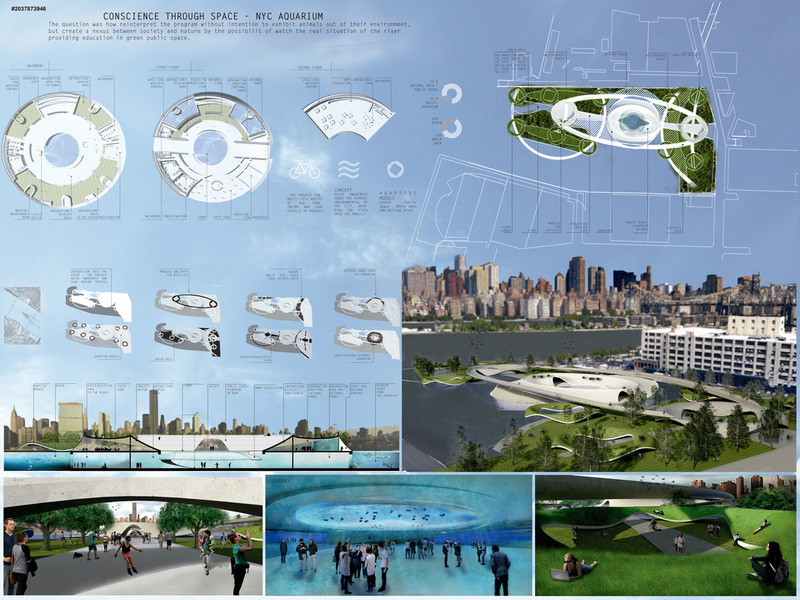 Using local building materials and natural systems creates a regenerative public space design and an anchor for the future of the region. Man's relationship with the sea is highly interactive as it is important, manifold and long-lasting. 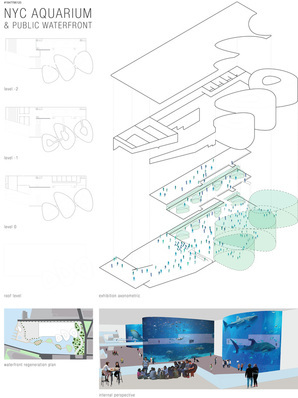 As far as we see it, designing an aquarium presents a great opportunity to highlight man’s relationship to the sea and go beyond the simple notion of a "zoo" in which various marine species are on display, by providing a complete sea experience.The basic design principle was to recreate the interaction between the sea and the visitor as well as with the project itself, perceiving the sea as an integral part of the project and creating a single interlocking organism waiting to be explored. 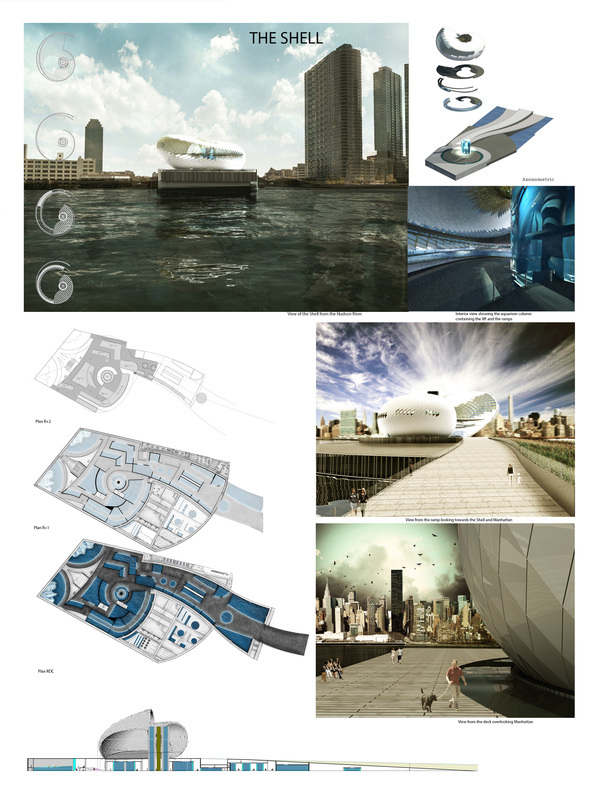 I wanted to design an iconic, recognizable landmark using organic shapes to refer to an existing aquatic element so I chose a Nautilus shell as my inspiration. I imagined a base on which the shell would sit. Upon arrival, the visitors either choose to enter that base where the visit starts ( local, temperate, polar and tropical) or go up the ramps, which lead them to a dock where the shell almost floats on a ring of water. The shell contains an aquarium lift, the mangrove, shops and the panoramic restaurant. 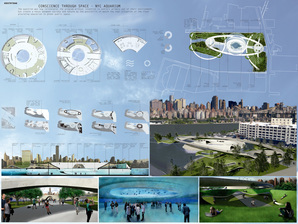 The base also house the administration/research areas. This is a multi-functional facility designed for the casual visitor, enthusiast, student & researcher alike. The diverse accommodation includes classrooms, a lecture theater, laboratories, substantial aquarium exhibits & public amenities. A visitor is greeted by three impressive 15m tall tanks & a vast internal space. This means each exhibit can be seen from a variety of perspectives whilst also dividing resident species by native geography. The building is the focal point to a regenerated & bustling area that promotes gathering through quality of space and activity, in addition, there is a restaurant & a marina set in a landscaped plaza. and offers a view of the skyline. Each unit is characterized by a thematic environment. The pools are arranged like an art exhibition and the visitors walk around them with ramps. 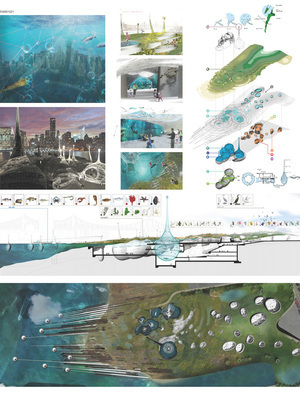 Aquariums are about experiencing life beneath the surface of water and learning from it. 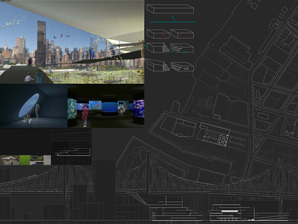 This aquarium emulates and surpasses such using light and space. Massive cylindrical tanks puncture a heavy cubic exterior. As these tanks pass through, the visitor has opportunities to view them on any side. Some tanks hover above, heavy with water and sea creatures. Others are topped on the floor, allowing the visitor to view through the entire building, should the day be bright and the water clear. 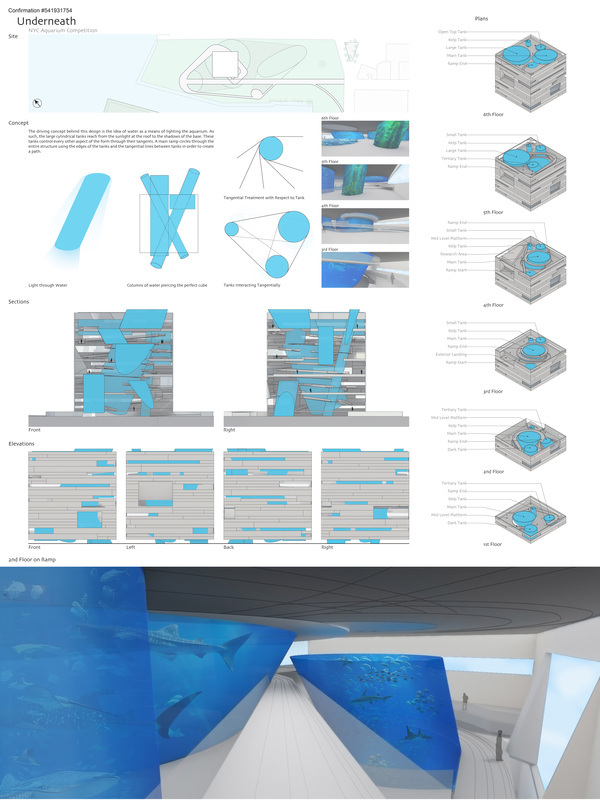 This way of experiencing aquariums will bring forth new methods of thinking and create further interest in marine study. Once the fishes are dead or bought, this aquarium will have one less exhibit. Aquariums give us a chance to admire sea creatures in their natural environment, a world inaccessible to most. However, as the apex predator of the planet, we demand control of every aspect of our living environment. 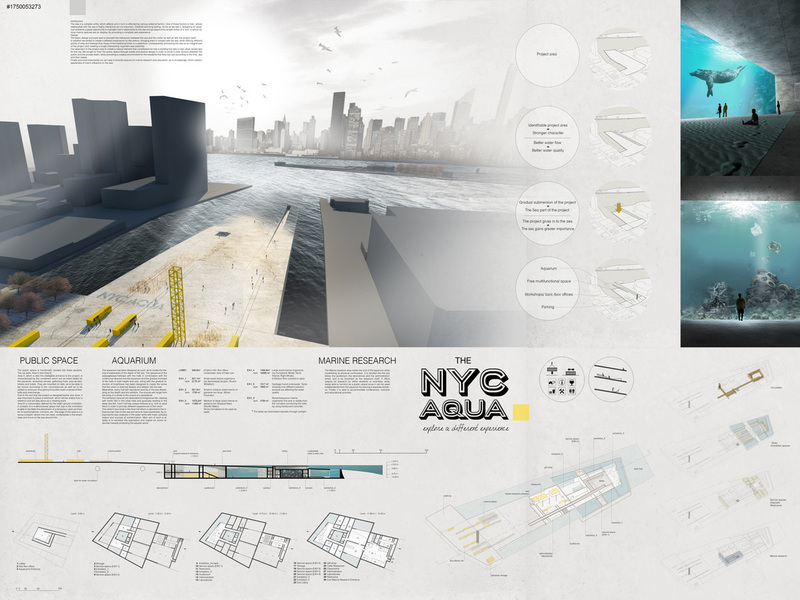 This aquarium demystifies the underwater world by revealing the candid economical relationship we have with aquatic animals. Humans have infiltrated and commodified everything in the sea. After its initial installation, this is a journey through a miniature economy that confronts ourselves with an uncomfortable truth of our impact on earth. 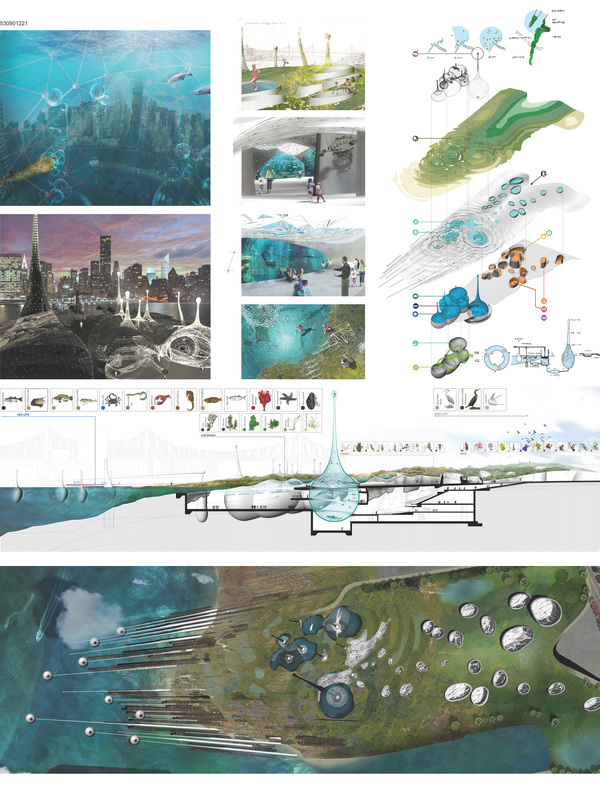 LATIN FOR PERMEARE, THE PROJECT EXPLORES THE PASSAGE THROUGH THE CRUST OF THE CITY AND BELOW THE RIVER TO EXPLORE THE AQUATIC VIVARIUM - PERMEABLE LANDSCAPES.AN AQUATIC ORGANISM EXTRACTING DISSOLVED OXYGEN FROM WATER. 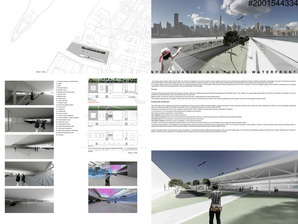 THE SWOLLEN LANDSCAPE GASPS FOR AIR – CLERESTORY APERTURES FLOOD DAYLIGHT INTO THE SUBTERRANEAN SPACES. 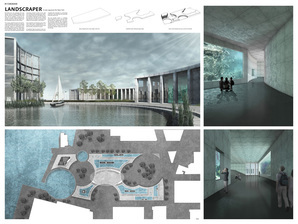 FILTERED THROUGH THE VIVARIUM SUBSTANCES, CAUSTIC NETWORKS OF LIGHT RAYS REFLECT AND REFRACT THROUGH THE AQUARIUMS AND PUBLIC PASSAGEWAYS – CONNECTING THE EXTERIOR AND INTERIOR ATMOSPHERES. 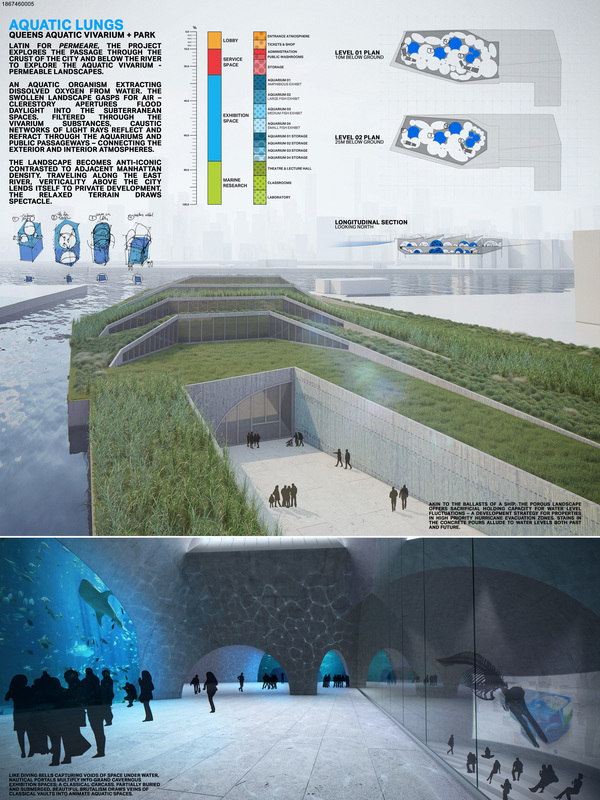 This project aims to maximize the efficiency of the public aquarium infrastructure in the success of the East River’s aquatic conditions. Through architectural and kinetic solutions this aquarium utilizes its structure in a two-fold programme; maintaining the quality of the aquatic exhibition space as well as endorsing the function of water treatment under the goals of the DEP. The design objective seeks to improve the success of marine life in the NYC Harbour. 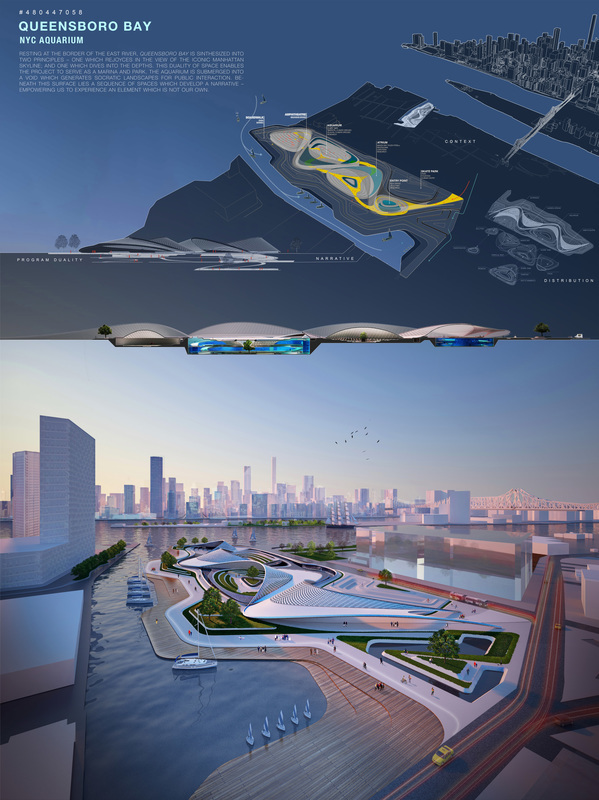 The East River Aquarium, located in Queens, has an incredible view to Manhattan. The intention was to integrate the neighborhood with a green area and the aquarium that is not only an aquarium, but also a cultural center for the community. 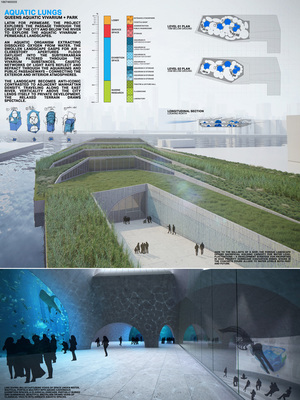 The Marine Research is located close to the tanks so that the visitors can interact. The aquarium program is fragmented to integrate with the park and allow different experiences to the visitor. The buildings adapt to the topography that goes up to 30 ft. above the street level, which controls the surge problem while giving continuity. ‘The Drops’ contests the boundaries of architectural fantasy. The scheme is two part; 1) an iconic architectural assertion, and 2) an ecological intervention. As an icon, the crystal-like towers and giant sculptural levers draw on the historic references from the site. It is a bold new landmark on the Queens’ skyline. The design acts as a machine, regenerating the waters of the East River. 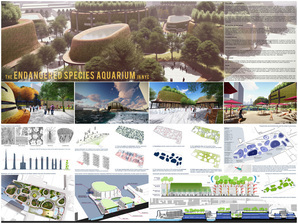 The entire site is an aquarium; both natural and contained. The land is in flux. The human experience is forever changing. Hypothesis: Can aquarium architecture mediate between land and sea to create an ecological city form? 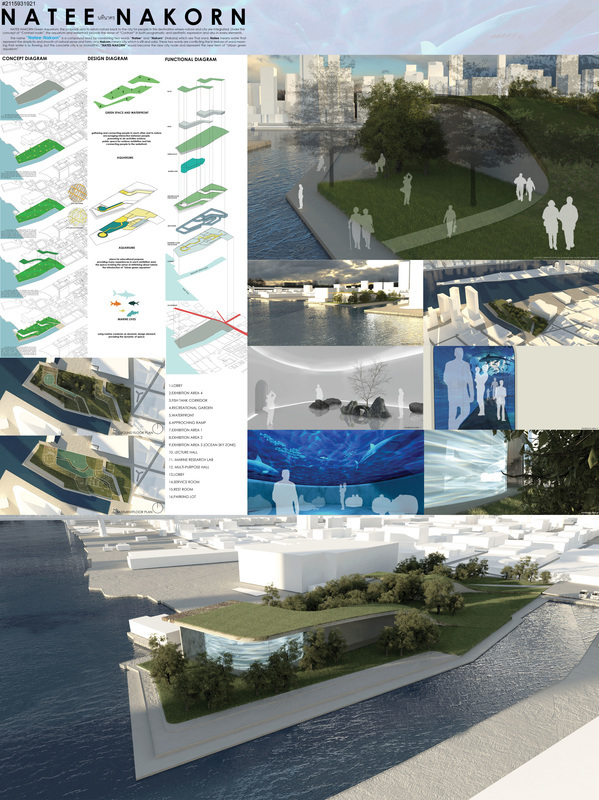 ​Our proposal aims to represent the Contrast node in the city and aims to introduce a new programmatic interpretation of the aquarium and waterfront which are associated with nature and the city. 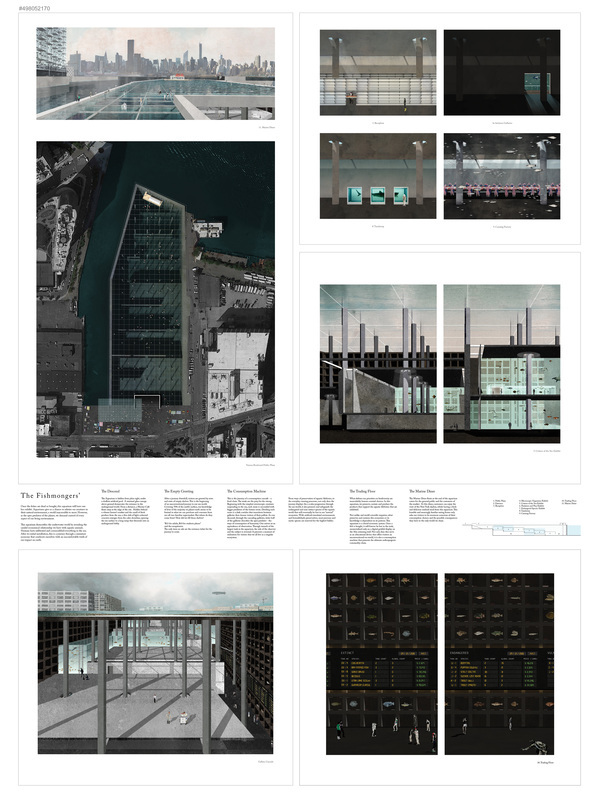 By integrating these associations into the design, the spatial composition differs from those of the cities and evokes the sense of conflicting feeling and experience to the design in aesthetic and programmatic dimension. 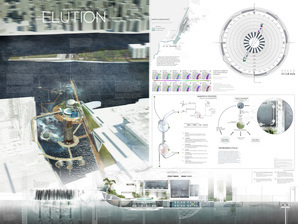 Furthermore, the project aims to raise public awareness and encourage people to re-contemplate the habitats and ecosystems surrounding the city which human are longing for.